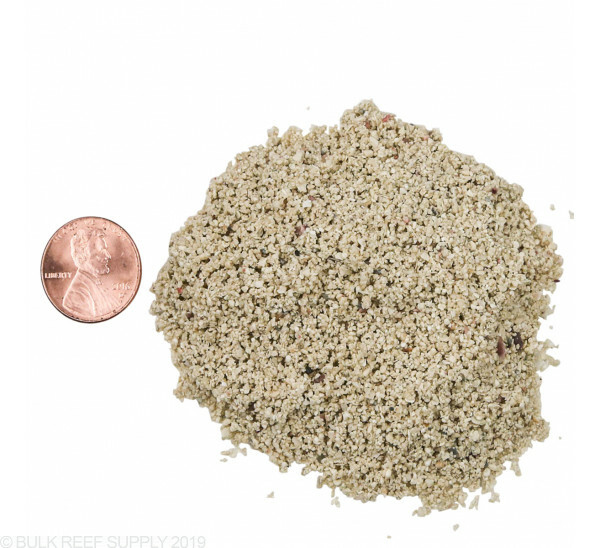 If we had to choose a single type of sand for any tank, it would be the Arag-Alive Fiji Pink sand. It is by far the most popular sand for its medium to large grain size, high amount of total available surface area, as well as just its overall beauty. Fiji Pink Arag-Alive! 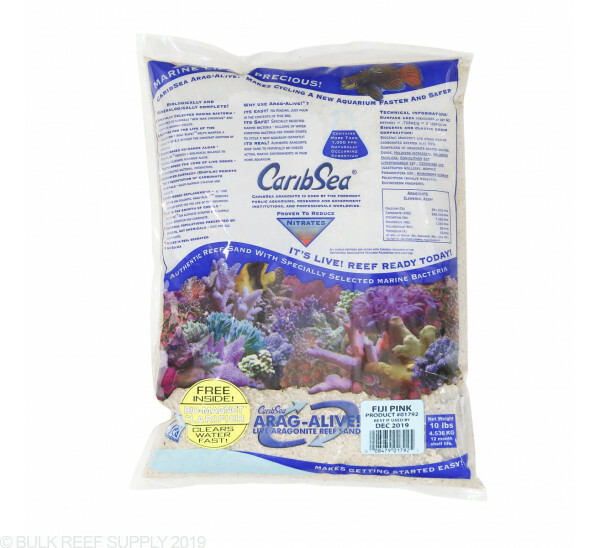 Live Aragonite Reef Sand contains millions of live bacteria to create a natural biological balance in your reef tank. Below is a table of common tank sizes and how many pounds of Fiji Pink sand is required to achieve a certain depth. Results may vary depending on the aquascaping in your tank, overflow styles, and the specific tank manufacturer. We always recommend getting a little extra sand to make sure you have enough on hand when you are filling your tank. Sand looks great in the tank and I am very happy with how quickly it all settles down, especially with the stabilizer packet. This sand is a small grain size and that is what I was expecting. It works great and the water was clear within 24 hours. I like the small packet which comes inside which helps with the water clarity. I definitely would recommend this sand if you are looking for fine sand. 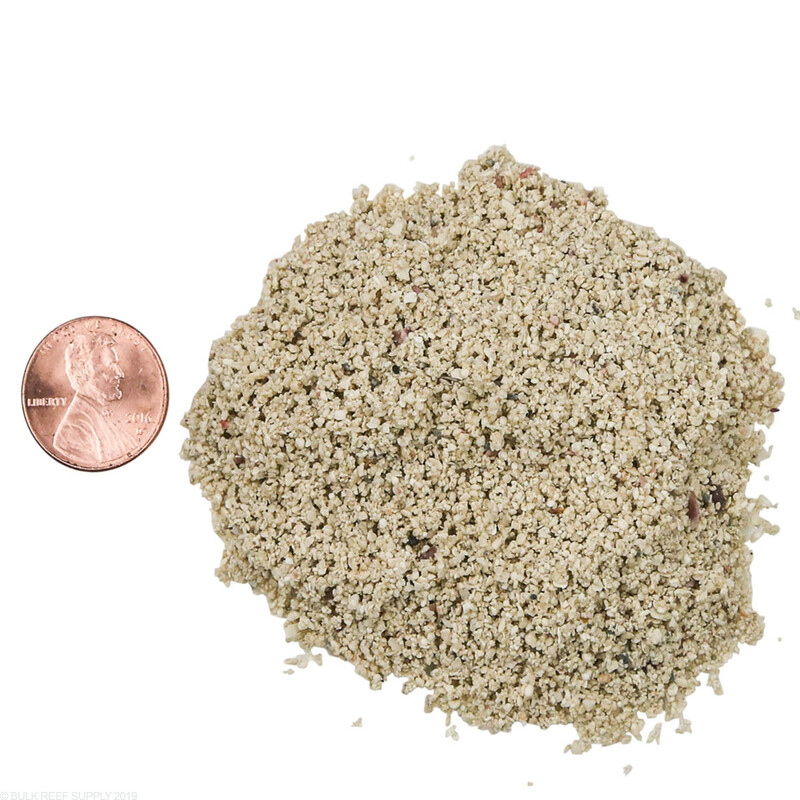 I bought this sand to mix with my African sand. It's a good sand, though I do recommend heavy rinsing if adding to an established tank. Pretty uniform grain size, and easy to clean. Definitely not pink, so don't expect it to be. A light tan with barely noticeable pink flecks. I would recommend, and I would purchase again. This sand is a small grain size but works well with good flow if you set your exceptions correctly. If you dump this in a new tank and expect clear water and it to settle inside one week and start adding corals you are in the wrong hobby. Slow and steady wins the race.I use MP10 and MP40s with it and no issues after a few weeks. Yes any pump will agitate any sand in the short term. But, after it settles it is fine. Also, it's not pink so if you think you are getting pink sand don't buy. It has flecks of colors that are nice and natural. The pink bits in this sand are only noticeable in the bags once in the tank you don't see um at all. This is a very fine sand and using 2 Hydor Koralia powerheads 1950 gph each move this sand into piles in the tank. 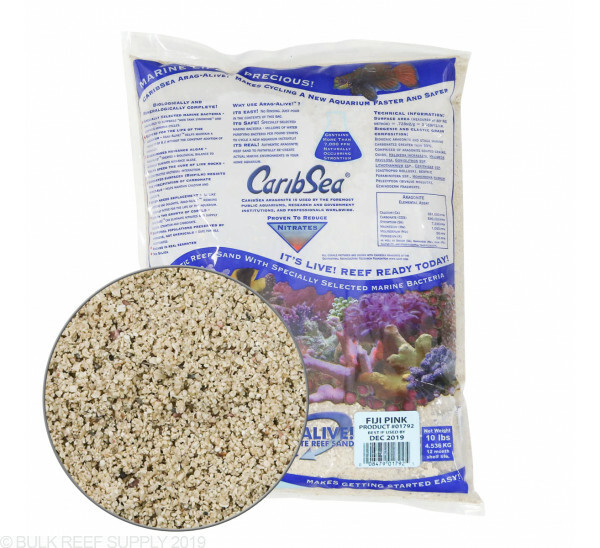 If your like me and have high turbulence powerheads do yourself a favor and add a Large grain sand like the arag alive Florida Crushed coral along with this Fiji fine grain sand to keep your sand in place. Shipping was excellent, heavy but very fast. Fast and accurate service! That's number 1! As for the Fiji pink, I got it because I was looking for a tan sand to mix with some African Cichlid sand I had purchased prior. It was a salt and pepper mix, and I wanted to tone it down some. This sand blended perfectly as the grain size was a perfect match. It's definitely not pink, it is tan. It lightens up even more under tank lighting. Very uniform, and settles quickly. I should add that since this was going in a Malawi tank, I did lightly rinse the sand before mixing. I really couldn't be happier. Great product for my needs. I really can't tell if there are any of the little pink sparkly things in there, it looks like basic live sand to me. It is a really fine sand, not recommended for super high flow, turbulent, tidal, monsoon, type areas. I am pleased with it, but I am easy to please. This works really well for me. It's fine but doesn't blow around badly unless there's strong direct flow. It is mostly white under my Kessil lights moreso than pink and I like it. 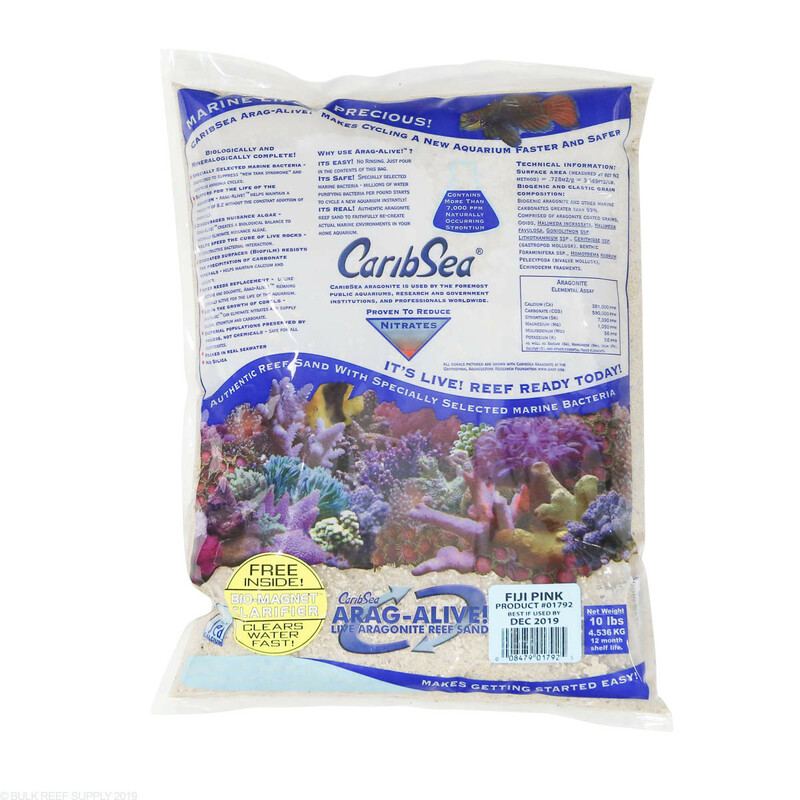 Clears very quickly with the packet and didn't seem to affect any of my coral or inverts (I was adding to an existing tank). Personally chose this sand because Brs recommended it. It looks like sand and feels like sand. I could tell it had pink sparkles in the bag but it just looks like white sand in the tank to me. I used a Brs 2 inch pipe to add the 10 lbs on top of my existing Fiji pink sand. How much of this would I need for a normal 75g tank? I am looking at having a 2in deep sand bed. It depends on the exact dimensions of your tank but assuming its 48x18 like most 75g tanks then your looking at about 100lbs for a 2" sand bed. It depends on how deep of a sand bed that you are looking for. Assuming your tank is a standard 55g dimensions you can expect roughly a 1" sand bed for each 35lbs of sand that you use though. It certainly can be added without much of a new cycle. 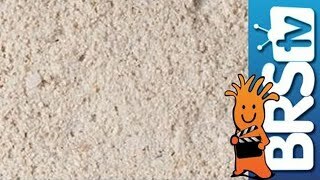 You will ideally want to rinse the sand beforehand in tank water to removed the dust and fines when placing in the new sand. Feel free to let us know if you have any further questions. For a 1" sand bed you will need 25 lbs. for a 2" sand bed you can double the amount to 50 lbs. Feel free to let us know if you have any further questions! The Fiji Pink is not shipped with "ocean" water, rather it is dormant bacteria and saltwater and does not contain hitchhikers or other pests. Feel free to let us know if you have any further questions! 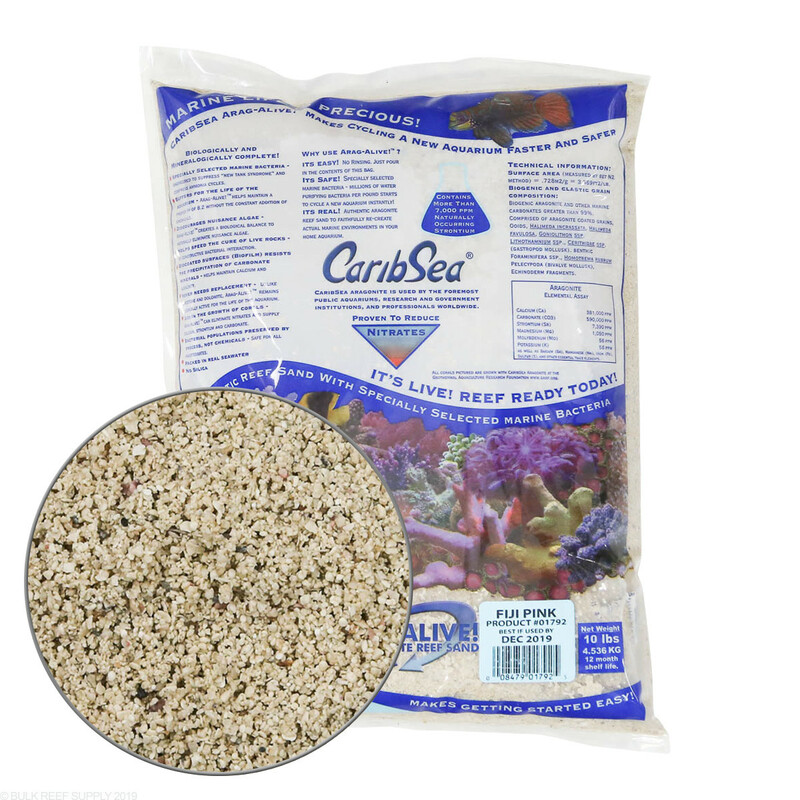 How much of this sand would I need for my 300 gallon tank? The dimensions are 24" from front to back, 37" from top to bottom. unfortunately I was unable to find the length of the tank provided. If you tank is 72" long and 24" front to back you will need around 100 lbs for 1.5" deep sand bed across the tank. Feel free to let us know if you have any further questions! I would like to add some sand to my tank. Is the clarifier that comes with this reef safe to use? The clarifier is included is reef safe and may make your skimmer start acting up if it is running. Feel free to let us know if you have any further questions! I will be starting up a 75 gallon Rimless (48x18x21) in the coming weeks and wonder how much of this sand I would need. I am not looking for the deep sand bed trick, just need the right amount for a nice layer. Assuming 100 lbs like the previous question by Bud. Also, what is more recommended....place the rock structure onto the base glass of the tank and filling sand around the rock, or laying the bed first and shifting the rock into the base? What works well in terms of minimizing any deadly detritus build up? Thanks for your time. 100lbs should be plenty for a nice 2" or so sandbed in that size tank. When it comes to aquascaping I always put the rock down first. That way you don't have to worry about a critter digging the sand out under the rock and causing a land slide or anything. Will BRS ever get Tropic Eden sand? Unfortunately bringing in heavy items such as sand does take some time and accounting. I have submitted the request to look into bringing in more options such as Tropic Eden. Feel free to let us know if you have any further questions! Hello I am looking to start my first salt water tank but want to start with a 12 gallon tank how much sand would I need,and what other stuff do I need besides the live rocks.. I have a few fresh water tanks. How deep of a sandbed is largely dependent on your own aesthetic preference unless you happen to have a critter that requires a certain amount of sand (like a Jawfish for example). For a tank that size you will get about an inch of sand for every 50lbs which would be plenty if you don't have any critters that require more. How much of this product would I need to cover a 36" x 18" surface to a depth of 1"-2"? Right about 70lbs of sand would get you about 2" of sand bed on a footprint that size. It has the beneficial bacteria in it which is what makes it "alive" but it will still be pest free. Adding 1" of sand to a 27x72 area would require right about 100lbs of sand. How much sand do I need for a 120 gal tank? Assuming standard 2ft x 4ft dimensions of most 120g tanks. 120lbs would get you about a 2" sand bed which is pretty typical for most folks. Would this sand work for an already established tank. I plan on replacing crushed coral with fiji pink. Dont know if I want to put live sand in. It wouldn't be a problem at all to use this with an existing tank. The biggest concern would be to make sure you remove the old substrate a little bit at a time. You don't want to remove it all at once as there may be a high population of your bacterial filtration on it. What is the shelf life of this sand? I want to purchase this now that it's on sale but will not be using it for perhaps a month or so.